I'm a writer, not an editor. But I'm also a college student who doesn't have enough money to pay someone to edit my book for me. So that means I have to be an editor. I loathe editing. Seriously. When I finished Unperfected, I skipped right over the editing process and went straight to book two. My mindset was write first, edit later. Most people would probably think this is weird. Why move on to writing more books instead of focusing on editing the book you already finished? 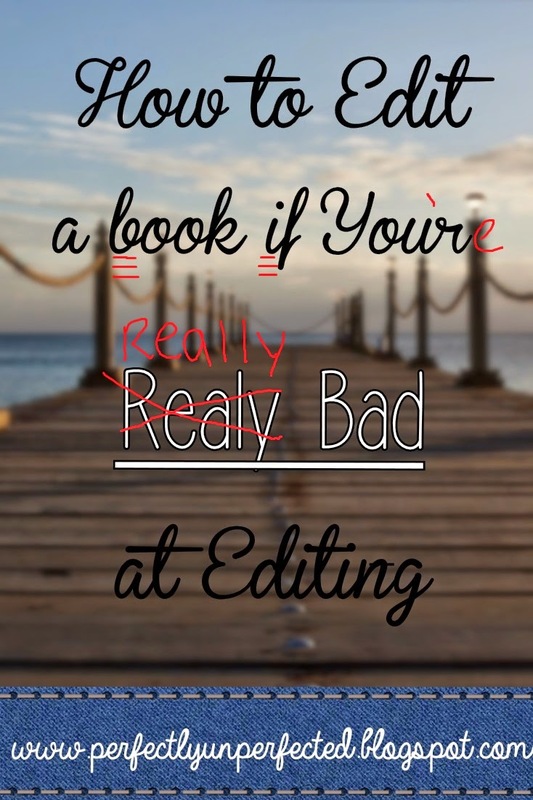 Well, two reasons: One, I'm not good at editing. And two, I didn't think there was much to edit. But OH, was I wrong. I finished book number two and instinctively moved on to book number three, and (you guessed it) I burned out. My brain had just gone through writing a 300+ page book in four months as well as juggling homework and school, and suddenly writing book three seemed like the hardest thing in the world. So, I finally turned my attention back to book number one. Since I knew I'd have to seriously edit eventually, I purposefully took a break from reading Unperfected while I wrote book two. So when I read it over again, I just...gah. I realized I had a looot of work to do. Let me start with what I refer to as simple editing versus serious editing. For me, simple editing consists of reading through my manuscript and jotting down notes or fixing teeny little errors. Serious editing, however, is where I sit down and take the manuscript apart chapter by chapter and delete paragraphs, rewrite chapters, etc. I dabbled with simple editing on and off while I wrote book two, usually during free periods or breaks at school. But I didn't do a serious edit of Unperfected until I absolutely had to. And when I did, I learned quite a bit about the editing process as well as how to properly self-edit a manuscript. So if you're a poor college student like me and/or you just don't want to pay someone else to edit for you, here are some tips to editing your manuscript yourself. 1. Take it slow. Don't try to tackle the whole thing at once. Trust me. You'll hurt yourself. Get out your phone, your calendar, your arm--heck, I don't care--wherever you keep your notes or schedules. Sit down and make a plan. Decide how much you want to edit per day and which days you want to do it. For me, my plan was to edit one chapter per day Monday through Friday and take a break on the weekend. However, (and this is perfectly acceptable) sometimes I would edit two chapters on Monday and none on Tuesday. Or sometimes I'd skip my planned edits for Thursday and Friday and do them both on Saturday. It doesn't really matter what kind of plan you make; it's just good to make one. 2. Pick a task. So you've got a chapter to edit--great! But there's still one problem, and that's the focus of this editing session. Should you focus on sentence structure? Grammar? Spelling? Character development? Dialogue? The options are endless, and sometimes that can be very overwhelming. That's why it's always good to edit in layers. I like to do my editing in three or four layers, starting with making notes and checking for grammar mistakes. Next I move onto dialogue and making sure it's properly punctuated. Then I focus on sentence structure, wording, and descriptions. Finally, I focus on the big stuff like character development, repetitive phrases, and deleting unnecessary scenes. It's always good to start small, so if this is your first edit of the chapter, try to focus on smaller things first. 3. Split the document. When I first started editing Unperfected, I made a copy of the entire word document and tried to edit chapter by chapter all in one document. That may work for some people, but if your book is long like mine, then you may notice the document lagging or seeming too crowded. After a while it became too irritating for me to have to scroll allll the way through my chapters or search the document to find where my last edit spot was. That's when I switched from editing in one document, to many. Create a folder on your desktop and name it "Editing" or whatever. Then open a new word document and copy and paste your first chapter into said document for editing. Eventually, you'll get something like the picture to the right. Not only is this a good and organized method for editing, but it also allows you to delete and change as much as you want while still having a completely original and untouched file of your manuscript on hand. 4. Keep consistent errors in mind. Everyone makes mistakes, and sometimes certain mistakes are more consistent than others--especially in writing. When you sit down to edit, keep some of your own common writing errors in mind. Do you slip up there, their, and they're? Do you tend to punctuate dialogue wrong? More often than not I find myself using "you're" when it should be "your." Yes, I most definitely know the difference between the two, but for some reason I still unintentionally mix them up when I'm typing. But now that I know I make that mistake a lot, it's easy for me to search for it when I revise my writing. So think about common writing mistakes you make, and keep them towards the front of your mind when you edit. You could even write a list of your common mistakes so you have them to look back on in case you forget. 5. Use a program. When I edit, there are two programs that I like to use to help me along. Number one is Natural Reader, which is free to download. Basically you copy and paste and/or upload your document, and natural reader will read it back to you in a "natural" voice. Now, the voices aren't the most natural, but the app is still helpful since it helps you hear mistakes you didn't catch before, and it also let's you decide if a sentence is flowing or not. The second program I love is the Hemingway App. With this program, copy and paste your writing and watch as the app checks for readability level, difficult sentences, and more. There are a lot of other super helpful programs too, but these two are my favorites. 6. Ask for help. If you have a good writing friend or someone who would be willing to help you edit if asked, then by all means, ask them. I was lucky enough to have a friend who wanted to read my book but also offered to edit it and give feedback as he read. (Shout out to Russell. You rock, dude.) It was incredibly helpful. A lot of people asked if they could read my book, and while I was skeptical at first because I didn't want to let too many people read it for free, I finally decided to let a few people read it so I could gather their feedback and use it to make my book even better. I still hate editing, but I don't dread it as much as I used to. In fact, right now I'm going through my first round of edits for book two. While it may seem like a real drag, and even if you're not very good at it, editing is a necessary step in the writing process. It's the step that takes your messy clump of a story and transforms it into a beautifully polished work of art ready to share with the world. So don't stress! Editing is tough, but doable. And when you finish, you'll have yourself a story that shines. And, this is a great post! Great advice! Hey! Visiting from the GTW's link-up. Yup. This is oh-so-good advice. Thank you for the resource to the 'natural reader' program! I'm planning to read my novel out loud for my second round of edits, but having a program do it for me (even if they sound weird) would be super helpful.